Time is of the essence when I cook; the easier the better. Which is why I am all for recipes that require minimal ingredients and prep time. 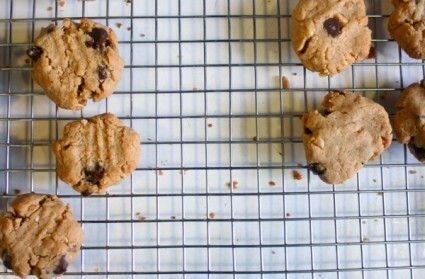 Enter these peanut butter cookies which are so easy it’s almost stupid. 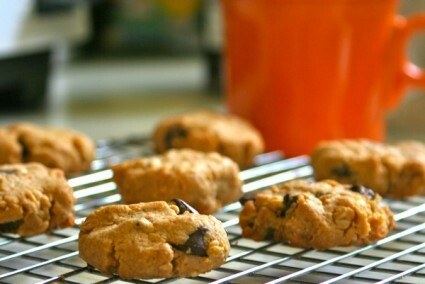 They’re gluten free and are as easy as a jar of peanut butter sitting in your pantry and an egg in the refrigerator. They can also be made quick enough that you can have them finished before your morning coffee break (no really, I tried that), and the end result is a perfect combination of sweet and salty. Ideal if you are a peanut butter addict. Coffee break or post-run recovery snack (yes, please!) you should put these on your baking to-do list immediately. In a bowl, combine egg, sugar and vanilla extract. Add in peanut butter and chocolate chips and stir together. Scoop out about a tablespoon of dough and roll into a ball. Place on greased baking sheet and flatten carefully with a fork. Bake at 350F for 12-16 minutes. Let sit for a couple of minutes before transferring them to a cooling rack. Oh, did you say you wanted these to be vegan? Easy. Just substitute the egg for 1 tablespoon ground flaxseed mixed with 3 tablespoons of warm water. Let sit and congeal for a few minutes before adding to rest of ingredients. Should We Care About Organic Food?